Tokachi Tsuchiya's A Normal Life, Please! (Futsu no Shigoto ga Shitai) is a recent addition to the long tradition of do-it-yourself documentaries in Japan that, using the camera as a weapon, attempts to exact social change and redress injustice - in this case in the workplace. Featuring some jaw-dropping moments, the film, which received its overseas premiere at Nippon Connection in 2009, exposes the ugly face of Japanese industry as truck driver Nobukazu Kaikura, a sub-contractor for the Fucox cement haulage company, is pitted against his employers. Working a staggering 552 hours a month without benefits or sick pay, a regime that barely affords him time to wash or eat and which is driving him towards an early grave, Kaikura is encouraged to join his workers union, an act that pits him against his company and their "associate" Mitsuo Kudo, a dubious character with a snarl, tattoos, and an entourage of hired thugs who are prepared to go to any means to keep him in line with company policy. Examining the repercussions of the Japanese government's steps to relax labour regulations since the 1990s under the pretext of increased competition in the global market - which has resulted in over a 16 million irregular workers in Japan employed under rapidly worsening conditions - A Normal Life, Please! picked up the award for Best Documentary at the 17th Raindance Film Festival in London. Jasper Sharp spoke to Tsuchiya, with Sayaka Smith interpreting, just before the results were announced. How did you get to meet Kaikura, the subject of your film? Originally I wasn't thinking of making a documentary. I was approached by Kaikura's trade union to record any proof of intimidation on the company's side in case things got violent, so the footage could be used as legal evidence if things went to court. They approached me as a freelance cameraman, which is my actual job, so there was never the intention that the footage would end up in an actual film. How long did you spend filming? The entire process from my being hired and the completed film was about two years. Did you ever have any idea that things would get so dangerous? Faintly. I knew about the character Kudo-san, and I knew he was connected with the yakuza world and that he was a pretty scary person, so I did have my reservations. Did you feel like stopping at any point? I never felt like I wanted to quit, but you know the scene where the yakuza come and disrupt Kaikura's mother's funeral? For about a week after that I felt really distressed and wondered what I should do. I wondered whether my presence there with the camera had exacerbated the situation. I was a bit worried Kudo was going to turn up at the theatre when we first started screening the film in Tokyo, actually. Do you think Kaikura's predicament is a common one in Japan? It's probably not quite as violent as in this particular case, but bullying or intimidation by the mafia, that can happen. What surprised me was that such a big, apparently respectable company as Kaikura's employer Fucox would have these links with the yakuza. The cement industry is quite a special one in Japan, as it was one of the first to be privatised, around the time of the Meiji era, so there's a really long history with this particular sector as a private industry. Before the Meiji era, there wasn't such a thing as a government as we know it, there was the so-called bakufu system, or "tent government." The elite samurai were appointed to various administrative positions, as the equivalent of members of parliament. Many of those who couldn't work in such positions went into the concrete or cement industry. So there was already a strong yakuza presence in this industry even before the Meiji restoration. Is this connected in any way with the so-called 'construction state' (doken kokka) that became quite notorious from the 1970s onwards, where the government poured far more investment into the construction of public works than was necessary. Taro Aso, the former Prime Minister of the Liberal Democrat Party (Jiminto), has a direct link with this industry too, through his family owning a cement company. There's always been a strong link between the LDP, who were the ruling party for a very long time, and the construction industry, so this accounts for it. For government projects, municipal buildings, and other state-funded projects, there's fierce competition between the various construction companies who pay a lot of money to put their tenders forward. There's only a few major companies who give quotes about how much the projects will cost, but naturally the government will want to use the one which gives the lowest quote, so this means that the cement companies are forced to lower their costs to be competitive. Cement itself costs next to nothing to produce, as it comes from the ground, so it's the workers involved in getting the product to the construction site that get squeezed. Do you think it's just the construction industry at the moment that is so severe, or are there other industries having similar problems? It's a general problem in Japan, for example the hairdressing industry is one of the worst, the visual media, motorcycle couriers, etc. - all those lower down the company hierarchy doing the work under someone else. This reminds me of a similarly-themed documentary, A Permanent Part-timer in Distress (Sonan Furiita), that came out about a year or so ago, which looked at a recent university graduate who is doing part-time casual work. As a part-timer, he has a very low hourly rate, long hours, no paid holidays, no insurance - in fact very little rights at all. I always thought that full-time employees were generally treated pretty well by their companies in Japan, so I'm wondering if you can tell me a bit about the deregulation of the labour market that has led to such poor working conditions for so many people in Japan. This is very much connected with deregulation. It never used to be like this in the construction industry. Then in 2003 there was mass deregulation across the whole labour market, so in every industry temps might be earning about a third of what full-time employees would earn. So if an average full-time employee earns about 6 million yen a year, a temp would earn about 2 million yen for doing exactly the same job. This seems quite different from the corporate 'salaryman' culture of, say, the 1980s, where an employee might not be earning a huge amount, but it would be enough to have a comfortable enough life on, and everyone in the company would be roughly on about the same level. This was around the time of the Bubble Economy, before the collapse of the 1990s, and no one really worried about how much they were earning as all employees were fairly well off. I think it was the legacy of Thatcher in Britain that led to the deregulation of the market in Japan. They wanted to mimic what happened in England. It's always been accepted in Japan that if you want to earn lots of money you have to work long hours, so this has now become the norm; long hours are part of the criteria when you're applying for a job. If I look at the Heisei Period, from 1989 onwards, compared with other periods of Japanese history, or other generations, people aren't really very politically active. What struck me was that last time I was in Tokyo, I did see people holding up placards and handing out for flyers for a forthcoming demo about workers rights. Do you think the system might be reaching a crisis point? I think it is to do with the attitudes of young people today. They're generally not really interested in using their energy to protest against anything these days, but nowadays some people might be realising that demos are a perfectly acceptable way of getting your point across, so there might be a slight shift in this respect. At the same time, trade unions give the impression to outsiders that they're a men's world, without many women involved. Speaking personally, I don't think the image put forward by the unions is particularly appealing. And then there's the concept of the 'freeter', the part-time worker, which about 10 years ago was considered a really cool thing to be. A lot of young people wanted to become a temp, because of the freedom it promised, and the lack of ties you had to your employees. This is part of the problems as well. This reminds me of the scene in A Permanent Part-timer in Distress, when the older man is trying to drum into the main character's head what being a 'freeter' really means, when he says "Who's free? You're not free. The company is free, free to get rid of you whenever they want." I'm not sure if the Japanese employment system is similar to England, but it used to be the case that your income went up as you got older. The older you are, the more you earn, regardless of how good you are at your job. But this system has changed recently, and most young people don't want to wait until they reach a certain age before they're earning a good salary. So they're encouraged to change jobs all the time, to get a better wage. This film, A Permanent Part-timer in Distress, is really about those young people who don't know what they want to do in life, and can't see the future. Your film is very active in encouraging people not to be afraid of joining a union. Can you tell me a little about your own experiences with regards to this? There was a time when I was made redundant from my previous employment, and up until this time, I had no idea of how I could fight for my rights against the company, but I found the union really useful in this kind of situation. So this was my first involvement with a trade union. I actually studied law at university, so it's a bit embarrassing, but I should have actually known more about labour regulations. I knew about it in principle, but I didn't know how it could be beneficial to my own situation. It's interesting, because when I was teaching in Japan, the eikaiwa industry (English language conversation) is notorious for ignoring labour regulations, apart from the final company I worked at, which was very unusual in that it did have a union. At the same time, I did notice that among some of the other teachers, particularly the Americans, there was this slightly negative feeling towards the idea of a union, as if there was something "communist" about it. I heard that the concept of trade unions originated in the pubs in England. If one of the workers didn't have any money, there would be a pot that all his co-workers had paid into which he could take what he needed from. It's totally different from communism; they're sharing their money and helping each other. Communism would be if everyone paid money to one person above them who looked after it and then allocated it out. You are also involved with the Video Act group. I joined about 2 years after the group formed, so I don't know too much about its origins. It was modelled on the American group Paper Tiger Television. The founders of Video Act saw Paper Tiger TV and decided to form a similar image network group in Japan. By the way, I'm not related in any way to my fellow Video Act member Yutaka Tsuchiya at all, even though we have the same family name. Anyway, we don't have an office, but we always have meetings about once a month, just the members, and we organise screenings every two months where we show films - not just mine, but other filmmakers' too. Anyone can come to these screenings, which we advertise using flyers or by the internet. It's a slow process, and over the last seven years it's just been the same five core members coming to the actual meetings, so we probably need to try a bit harder to expand. Outside of Video Act, how widely did A Normal Life, Please! get screened? It has screened in about 15 regular commercial cinemas across Japan, from Hokkaido to Kyushu. What sort of reaction has the film received? I've seen quite a few people who worked as cycle or motorcycle couriers coming, who were very moved by it, because they also work under a similar system of payment, depending on how long they work, how many jobs they do, etc. I guess they could identify with it. Taxi drivers and substitute teachers too: You know how regular teachers get paid for when they're not teaching, during the summer or spring breaks, for example. Well, substitute teachers only get paid for when they're working, and this might be only two or three days a week. They can't earn a living wage like this. If they work for the state school system, they're not allowed to do any other part-time work either. So all these types of people, they've got together and organised their own screenings of the film too. There's been about 60 screenings held in this way. How about the reaction overseas? It has been screened in Hong Kong, Germany, Holland, Spain, and in two weeks time it's going to show in Taiwan. I've not been at most of these screenings, but the typical question I've had from overseas audiences has been "Why do you have to work so hard in Japan?" They can't believe why people do it. In Germany they were really surprised. Because Japan is known as the wealthiest country in Asia, audiences in Hong Kong for example assume that everyone in Japan leads a comfortable, happy life. Of course, you get similar stories in Hong Kong too, so they could probably understand the problems Kaikura was facing. It's not just in Japan where you get these sorts of problems. I remember you mentioning something earlier about a homeless community made up of temporary workers. After the Lehmans Brothers bank collapsed in September 2008, there were shock waves across the Japanese economy, and a lot of part-time workers lost their jobs very suddenly, in the financial industry, but also in the electronics and car industries, mainly those aged between 20 and 50 and mostly men. We knew that before the end of the year there were going to be large numbers of homeless people because of the economic downturn, and that we had to do something to help them out. So an emergency camp, the Dispatched Temporary Workers New Year Village (Toshikoshi Haken Mura) was set up in Hibiya Park, in front of the Ministry of Health, Labor, and Welfare, and from the 31st of December for 5 days, about 500-600 people came by asking for food or a place to stay. About 1700 volunteers came to help, raising money and putting on events for the New Year period, including members of the trade union movement, local government workers, politicians. Quite a lot of people participated in this movement. The campsite was really cold because it was the middle of winter, so someone negotiated with the Ministry of Welfare to let the homeless people stay in one of the conference rooms. I didn't film anything myself, but one of my friends shot some footage, enough to make a ten-minute short film. Can you tell me a little about your company, group Low Position? We established group Low Position in 2006, around the time I was making A Normal Life, Please! It's not a company, more a cooperation of three freelancers. We share an office, primarily as a way of dividing the rent. We just gave it a name for when one of us answered the phone. We all work independently of one another. We're not sharing income or anything, although we do share the work sometimes. However, all of us worked as cameramen on a new film, Dogs, Cats & Humans (Inu to Neko to Ningen), directed by Motoharu Iida. Actually, we established group Low Position to work on this documentary. In winter 2004, Iida had made Ashigara-san, about a homeless person who had been living on the streets of Shinjuku for years. An old woman came to the screening and I started talking to her. She said she had quite a bit of money from her life insurance, and she wanted to do something useful with it before she died, to expose cruelty to animals. So she basically commissioned this film to promote animal welfare. About 300,000 unwanted pets are put to death every year in Japan. We made this film as a way of raising awareness in people to look after animals properly. You don't see stray dogs in Japan at the moment, but there are a lot of stray cats, and because they aren't spayed, they breed intensively, and most of this large number of animals that are killed are kittens. So ideally with this film we'd like to see this number brought down. Animal rights activists like this old lady have this image as hysterical females in Japan, but we wanted to show that they genuinely do love animals and want to protect them. We look at the situation outside of Japan in the film too. 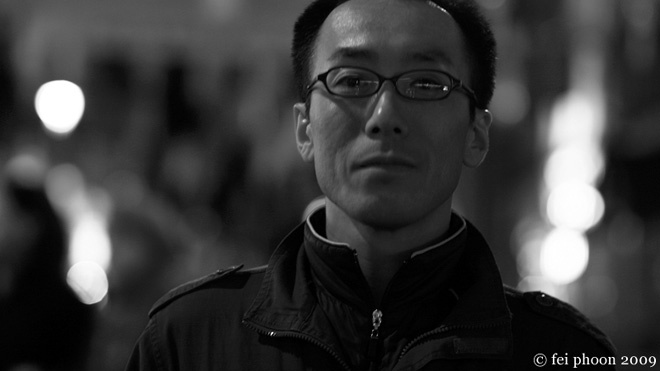 Iida came to England and shot a lot of footage there, all by himself, because we were working on a pretty low budget. Returning to the subject of labour regulations, you've just had a fairly dramatic change of government in Japan, from the long-ruling Liberal Democratic Party (Jiminto) to the relatively recently formed Democratic Party of Japan (Minshuto). Do you think there's actually going to be a change? There's got to be a change in regulations to give temporary workers a better deal. That's what I'm hoping personally. They'd submitted proposals to parliament already before the government changed. Now there's been a change in government they have to resubmit these proposals all over again, effectively starting afresh. They included changing the labour laws in their original manifesto, so maybe the situation will change. I'm optimistic the situation will change in the long run, but I'm not so sure I'll live to see it. It took a hundred years to completely change the old order after the Meiji restoration up until now, so it's going to take a long time to gradually reform this system we've developed since then. Life is short, so I'm rather hoping it will change while I'm still alive, but who knows.